Price is per 50 spacers - each measures 8mm x 3.5mm, drilled from top-to-bottom as hangles as a star shape. Silver colour. not real silver! Although findings are essential for creating any kind of jewelry, it's easy to forget about them when you are shopping for beads. Findings are like background music in movies. Jewelry with no findings will fail to dazzle, just like a movie with no music will fail to thrill the audience. The findings enhance and accent the focal beads without drawing too much attention to themselves, but you really need to have them to create a functional jewelry. You need wires to string the beads onto, whether they are flexible beading wire or rigid wire. 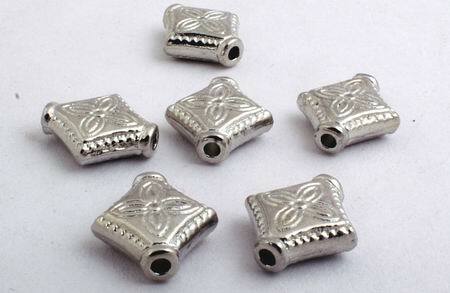 You must also have a clasp to create necklaces or bracelets, and jump rings to attach those clasps. Toggle clasps are the easiest to handle, but you can also use spring ring or lobster claw clasps if you want an adjustable length necklace. Spacers are also useful to both add-design and to economize on the beads used in a project. Items made with flexible wires will need crimp beads to secure the ends, and you'll want ear wires if you want to make earrings. These are the must-have items for jewelry making. You could create beaded jewelry without any metal beads, but they will help your jewelry appear more professional. They vary greatly in size, thickness, and shape so you can dramatically alter the style of your necklace by exchanging the metal beads. Spacers are excellent for adding just a sliver of metallic flash, while larger beads (often called Bali Beads) may be fancy enough to function as the focal beads in your designs. Try using small 925 gothic spacers in between colorful single beads for a classy effect as above - and cone or dome-shaped ones called bead caps are great for topping off a drop.